Tales from the Den of Chaos: No cold feet! 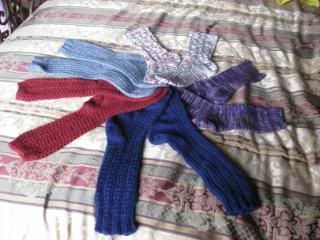 This Christmas, I declared war on cold feet and made socks for those (thankfully few) adults on my gift list. That’s the Waving Lace pattern from Interweave’s Favorite Socks. The lace broke up what would have been a plain stripe color and made it kind of funky fresh. Typically, I was frantically finishing the toe of the last sock on Christmas Eve. Not only did Christmas pull its usual thing where somehow, in spite of being there in plain black and white ink on the calendar, December 25 snuck up on me and came at least three weeks sooner than I expected, but also…well. It turns out that I apparently do not believe in the space-time continuum. Or at least, do not respect it as pertains to my knitting. For perfect (and extremely recent) example: It takes me between eight and twelve hours (depending on complexity and size) of hands-on knitting to finish a (one, singular) sock. 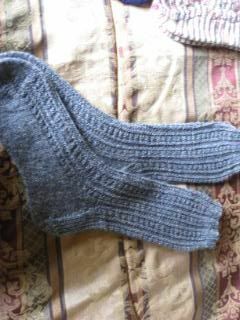 A pair of socks, therefore, takes me between sixteen and twenty-four hours of work to complete. 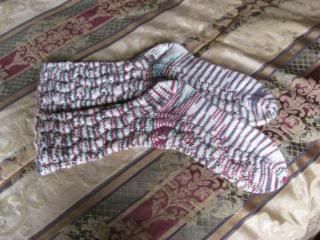 So when I cast on the last pair, which were for a man (larger size), and also decided to use the Retro Rib pattern both because it makes for a handsome finished sock and is interesting to knit, I said gaily to myself that Ha, ha!, these were probably going to take the whole twenty four hours to knit up, HA HA! So I cast on Monday, and expected to be wrapping them Wednesday morning. Because in my world, one can find enough time to put in sixteen hours of work-work, keep the family fed and in clean clothes, do the last-second Christmas shopping, pay the end of month bills and deal with approximately sixty thousand insurance and contract related questions WHILE ALSO getting in twenty four hours of knitting and perhaps a few hours of sleep…in a forty-eight hour period. Imagine my surprise when Wednesday morning rolled around and, in spite of neglecting the housework in a truly shameless way and perhaps attending a little less…attentively…to our business for two days, PLUS staying up until nearly midnight twice, I was only just turning the heel and starting the longer-than-I-expect-somehow jog to the toe. Stupid space-time continuum. It’s so…inflexible. There were a few tense moments in our relationship – the purls felt too slow and I was regretting choosing an “interesting” pattern before I hit the heel of the second sock because I was on! a! schedule! dammit!, but I forgave them when they turned out so handsome and since they are inanimate objects, it turned out that for their part there was nothing to forgive. And then I promptly tossed them into a box, wrapped them and handed them to my brother. Possibly still warm from the dryer, since I blocked them Christmas morning. As I was grafting the toes, I told myself happily that now I could take some time off from knitting. Because really, that was an awful lot of knitting and whew. Yeah. A little break would be good. Which is why, an hour later, I was squinting at five different skeins trying to decide which one was exactly right for a nice, lacy scarf, not too fancy but maybe just moderately, you know, interesting. Said the same thing myself. Finished all the Christmas Knitting very early Christmas Eve (I KNEW I could have worked one more scarf in...), and as I threw the last item in the last gift-box, I said: "How lovely to be finished! I'm Done With Knitting for a while now!" Which is why I'm eyeing my sock-yarn leftovers and trying to decide if I have enough to make wacky striped wristers...and wondering whatever happened to that lace scarf I abandoned when I took up my Christmas Knitting Mission? You missed the rabid monkey party? It was one of the best parts of the yule festivities! Glad all your dedication yielded finished objects! Now, what does a knitter do for relief? Knit, of course. Carry on! I hear you, and I feel your pain. 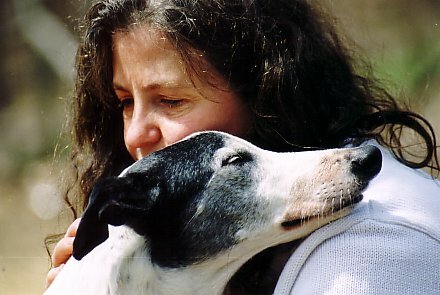 Or, I would, if I had any feeling left at in in my numb and tingling hands. Pulled the last pair of felted mittens out of the washer this a.m. The unfelted cuffs are still on the needles. I don't see the recipient until tonight, when the mittens themselves will still be damp. Am not only eyeing what's left of the yarn and calculating how many pairs I can make for MYSELF! !, but have THREE babies expected in my inner circle by February. It's all worth it when you see the socks propped up on the hassocks, crossed at the ankles, well worn and loved, at Christmas next year. You are very brave. I am too slow of a knitter to try that. Unless I start right now and knit until next Christmas. Those are *gorgeous*, especially the Waving Lace ones. Lovely work! Man what I wouldn't give for socks like those. Sigh.